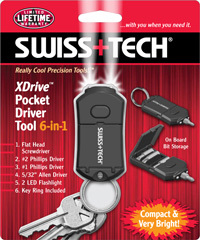 The new XDrive® Pocket Driver Tool is very compact, extremely lightweight and easy to use. 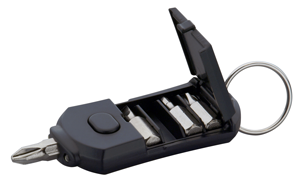 Its flip-open storage, magnetic socket and pushbutton LED flashlight add simple convenience to its functionality. The unique patent pending design is sure to make this versatile creation one of your favorite pocket-sized micro drivers. Product Size: 2.6" x 1.3" x .4"
Bit Size: 1/4" x 1"